Fellowship Previews: Dark Horse Announces Dark Horse Day Celebration To Take Place June 4! Dark Horse Announces Dark Horse Day Celebration To Take Place June 4! 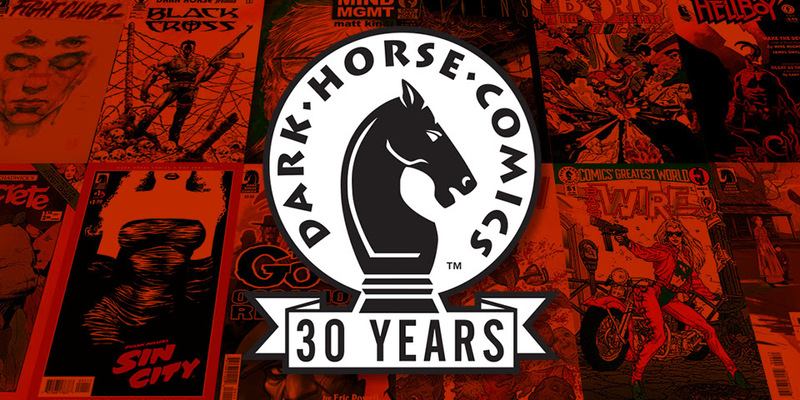 2016 marks the thirtieth anniversary of Dark Horse Comics, and it’s time to party! To celebrate, Dark Horse is proclaiming Saturday, June 4, 2016, to be “Dark Horse Day,” with events happening in comic shops around the country! We are inviting our retail partners to celebrate with us by offering exclusive promotional materials, ordering discounts on Dark Horse Comics backlist titles, and a commemorative Dark Horse Day Sampler comic! As Dark Horse Comics turns thirty, we present a look back at some of our top titles from past decades in an exclusive Dark Horse Day Sampler comic featuring classic stories including Aliens vs. Predator: Blood Time (1994), by Randy Stradley and Phill Norwood, Sin City: Daddy’s Little Girl (1996), by Frank Miller, andThe Umbrella Academy: Anywhere but Here (2008), by Gerard Way and Gabriel Bá! Plus: a new Buffy the Vampire Slayer tale by Christos Gage! The forty-page Dark Horse Day Sampler comic features a special cover by Steve Morris and will be available in comic shops everywhere on June 4. “It’s hard to believe it has been thirty years—mainly because the memories of seeing our first comics on the stands and going to conventions and meeting fans for the first time are still so clear. If you’re a Dark Horse fan, or if you’ve ever been a Dark Horse fan, I hope you join us for this milestone celebration!” added Dark Horse vice president of publishing Randy Stradley. Fans: Make sure to tell your retailer you want your local store to participate in this awesome celebration! Retailers: Look for the April cover-dated issue of Previews for details on participation levels, along with promotional support being offered by Dark Horse for the event!